The American composer Charles Tomlinson Griffes’s piano works represent a remarkable musical achievement. Griffes was active as a composer for little more than twelve years, and did not write prolifically, but nevertheless produced pieces of great maturity which are both concise and extraordinarily powerful, showing the contemporary European influences to which he was exposed but also demonstrating a highly individual compositional voice. His Roman Sketches Op 7 contains his most famous work, ‘The White Peacock’—an acknowledged Impressionist masterpiece—while the final movement, ‘Clouds’, clearly heralds the language of modernism. 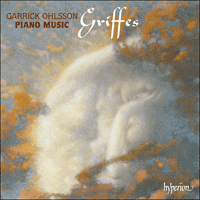 Almost all of Griffes’s piano music is present here, and the composer has never been better served on record than by his compatriot Garrick Ohlsson, who here applies the full force of his interpretive and technical prowess. Copland’s tribute, delivered at Harvard University some thirty-two years after Griffes’s death, was followed by a brief concert of American music, but none of Griffes’s works was performed that afternoon. No objections were raised, since at the time much of his output remained unpublished, recordings of his works were few, and only a handful of his shorter piano pieces were then considered part of the standard repertoire. Nonetheless, Copland’s homage was sincere, and when he himself died at the age of ninety—universally acclaimed as the Dean of American composers—many agreed that if Charles Tomlinson Griffes had enjoyed even half of his admirer’s immense lifespan, the American musical landscape between the Wars might have assumed a very different appearance. Griffes flourished during the sunset of European Romanticism, and the four years he spent in Germany exposed him repeatedly to the most prominent musical voices of the day. He was so taken with Strauss’s Salome—which premiered in Berlin in December 1906—that he heard the composer conduct it four times, but he was equally fascinated with the avant-garde of Debussy, Ravel and Scriabin, prompting him to write home to his mother: ‘I don’t know what I shall do in America without all these things.’ But even though the newest fashions were unmistakably influential on his growth, he quickly melded them into a distinct voice, forging a melodic and harmonic vocabulary unlike that of his contemporaries. Remarkably, though he was active for little more than a dozen years, he left a catalogue of superbly crafted compositions spanning distinct style ‘periods’, and his piano works are central to understanding his development. Though he rarely performed in major settings, he was a brilliant concert pianist, and the piano was always his first resource and closest confidant. Most of his larger compositions began at the keyboard, and some were even published as piano scores before he decided to orchestrate them. His cosmopolitan leanings had unlikely roots, for Griffes was born over 200 miles from New York City in Elmira, New York, a small community with a population that peaked during his teens at about 35,000. He was the third of five children born to Wilber and Clara (Tomlinson) Griffes, and though his maternal grandfather had been a prominent Elmira attorney, his father was far less successful, clerking in clothing shops for around $25 a week, and periodically moving his expanding family into various rented homes. Fortunately, when Charles’s gifts were recognized, he benefitted from the largesse of several individuals from outside his immediate family, most notably the New Zealand-born Mary Selena Broughton (1862–1922), who taught at Elmira College, and with whom he began piano lessons at the age of fifteen. Years earlier, Broughton had trained intensively in Germany with Karl Klindworth—a pupil of Liszt and confidant of Wagner—and as Griffes’s talents were developing, it was scarcely surprising that she sought to offer him a similar educational opportunity, especially since study in Germany was still viewed as a necessary rite of passage for gifted Americans. She also taught him harmony and oversaw his first youthful compositions, and though the Elmira Free Academy provided all the Griffes children with excellent educations, Charles’s piano studies convinced him that music was his rightful calling. On 21 May 1903, he played a graduation recital in the College Chapel which included demanding works of Chopin and Liszt—as well as two original songs setting French texts—and the high praise he received from three of the local papers helped to quell some of his parents’ concerns about music as a viable career. No doubt their anxieties were further mitigated by Broughton’s offer to underwrite a large portion of his studies abroad, and three months later, on 13 August, he set sail from Hoboken, New Jersey, on the Grosser Kurfürst, docking in Bremen eleven days later, and arriving by train in Berlin the following afternoon. Broughton was already there on summer holiday, and she helped him settle into the city’s cultural life by taking him to museums, concert halls, and even the Zoological Garden, where two days later he recorded a pivotal experience: ‘The animals were all out in the open cages … Among the peacocks was a pure white one—very curious.’ Griffes’s eye was as keen as his ear (though largely self taught, he was also a skilled painter), and no doubt this brief encounter served as an inspiration for what later became his most famous piano piece. Though he always aspired to compose, he originally planned only a two-year stay in Berlin to focus on the piano, and Broughton was grateful that he was accepted by Klindworth’s former pupil and colleague Ernst Jedliczka (1855–1904), an eminent Ukrainian pianist who taught at Berlin’s Stern Conservatory. The young American practised so assiduously that by June he was chosen to perform in a special students’ concert at the Beethoven-Saal, which Broughton even attended. When Jedliczka died less than two months later, Griffes joined the class of Gottfried Galston, a Leschetizky pupil whom he liked, but whose concert schedule was so demanding that (almost by default) Griffes began concentrating more on composition. His teacher, Philippe Rüfer, seems to have been highly systematic, asking him at first to make some corrections to his early French songs, before moving on to simple minuets and elementary orchestration exercises—assignments which Griffes considered highly worthwhile. By now his closest companion was Emil Joël, ‘a friend such as I never dreamed of finding in Berlin’. Despite the fact that Joël was seven years Griffes’s senior and a civil engineering student, they seemed inseparable, and at some point their relationship almost certainly became sexual. In his diary entries, Griffes was remarkably candid about his gay life, and though his public disclosures were far more discreet, his letters to friends and family confirm that Joël had become the centre of his world. He was also highly knowledgeable about music, and the two soon allied themselves in an effort to extend Griffes’s stay for another year. The twenty-one-year-old American was then in search of a more eminent composition teacher, and since he felt unprepared to meet the demands of the iconic Ferruccio Busoni, Joël strongly suggested he approach Engelbert Humperdinck (1854–1921), the highly regarded composer of Hänsel und Gretel. After negotiating an additional loan from Broughton, Griffes began working with Humperdinck in October 1905, and though he took only about nine (highly demanding) lessons from him, he later claimed that the experience was invaluable to his musical and intellectual development. As he became increasingly fluent in the language, he continued to assimilate himself into German culture. On Joël’s advice, he grew a moustache to enhance his mature image, he accepted pupils to offset his expenses, and he performed frequently both as soloist and accompanist. By the time he returned to Elmira in July 1907, he projected a new air of confidence, appearing at once self assured, and even debonair. For over a month, Griffes was uncertain of his direction, so in late September he was happy to accept a last-minute offer from the prestigious Hackley School for Boys in Tarrytown, New York, just twenty-five miles north of Manhattan. On Wednesdays and Saturdays, his free days, he often took the short train ride into Manhattan, where he frequented New York’s many museums and concert halls—as well as popular meeting places for gay men, such as the Lafayette Baths. Griffes especially welcomed the advice and counsel of composer Arthur Farwell (1872–1952), but by July even Farwell was re-examining the musical language of The Vale of Dreams (still untitled at this point), advising that it might be ‘too … ethereal and unearthly’. Griffes continued in his diary: ‘At the same time he considers that I am losing the sense of tonality.’ To be sure, the twenty-eight-year-old composer was clearly venturing into new harmonic territory, since the major thirds that wind so chromatically through his sensual, Debussyan textures often seem to stretch tonal boundaries. The Night Winds, completed a year earlier, is far more agitated, but the chromatic thirds—which provide a motivic connection to The Vale of Dreams—are offset by rapid arpeggios shaped around whole-tone scales, making the atmosphere again unmistakably Impressionistic. The most tranquil of the three, The Lake at Evening, was completed a year earlier in 1910, and it was also the first to be performed publicly, when Canadian pianist Leslie Hodgson premiered it in April 1914 at what is now Weill Recital Hall. Griffes noted that the performance went well—in fact, the crowd reaction was so positive that Schirmer even phoned Hodgson a few days later to ask if the work was published. Leaving aside the irony that the firm now seemed interested in a work they had rejected two years earlier, Griffes was further infuriated when he revisited their offices late in January 1915 only to have it rejected again—on the grounds that it was unlikely to be ‘much of a popular success’. German-born conductor and composer Kurt Schindler, one of their editors, added that he thought Griffes was writing ‘too dreamily and subjectively, and needed to get out into the outer world more’. Two months later, for the first time since his Berlin days, Griffes had a meeting with the legendary Busoni, now in New York on tour, and it proved to be a watershed in his professional advancement. After hearing The Vale of Dreams and several other works, Busoni immediately ‘sat down and wrote a letter to Schirmer recommending my pieces very highly’. As a result of this intervention, Griffes soon had a contract to issue the Tone-Pictures, which appeared as his Op 5, and eight additional manuscripts, including his Fantasy Pieces Op 6, which consisted of a lengthy Barcarolle, a Nocturne (Notturno), and a colourful Scherzo. Framed largely around the black keys, the Scherzo is a raucous frolic whose rhythmic left hand often outlines a pentatonic scale, while the right hand is punctuated by the hollow, open fifths he occasionally employed to suggest the exoticism of the Far East—to become a recurrent theme in his later works. Griffes was as passionate about literature as he was about aural and visual images, and in May 1915 he spent an entire day at the New York Public Library searching for appropriate verses to precede each of these pieces before they saw print. Within a week he had found prefatory texts to each of the Three Tone-Pictures, as well as the Fantasy Pieces, and even though he chose his ‘programmes’ after the fact, his verses seem to capture his musical moods with remarkable fidelity. For example, the Scherzo is prefaced by two sentences from an unknown poet referencing a ‘Palace of Enchantment’, where ‘fantastic spirits’ dance ‘grotesquely to a music now weird and mysterious’. For the others, he chose excerpts from Yeats, Poe, Verlaine, and William Sharp (1855–1905), a Scottish writer who produced numerous works under the pseudonym ‘Fiona MacLeod’. Griffes was especially drawn to Sharp’s poetry, and his 1891 free-verse collection, Sospiri di Roma, inspired no fewer than five additional works, including De profundis (‘Out of the depths’), which was completed in November 1915. But even though its majestic, enticing chains of Scriabin-like harmonies were much admired by Griffes’s friends and associates, it remained unpublished until 1976. On 23 August 1916, Schirmer accepted four additional Sospiri inspirations, soon to be known as the Roman Sketches Op 7, and undoubtedly the most famous of these is The White Peacock, which almost immediately assumed a permanent spot in the repertoire. Myra Hess recorded it as early as 1929, Samaroff a year later, and Griffes’s own interpretation is preserved on a 1919 Duo-Art piano roll. Whether the ‘real’ inspiration stemmed from his first visit to the Berlin Zoo, from Sharp’s poem, or simply—as he once told a friend—from gazing at a sunset during the train ride from Tarrytown to Manhattan, his mastery of Impressionistic imagery seems unassailable. Equally picturesque is the haunting Nightfall, with its seductive ninth and thirteenth chords, followed by the even more virtuosic The Fountain of the Acqua Paola, Griffes’s masterful homage to Liszt’s Les jeux d’eaux à la Villa d’Este. Cast in 7/4 time, Clouds, which concludes the set, floats through richly diatonic harmonies before fragmenting into a bi-tonality which clearly heralds the language of the twentieth century. Critical reactions to the Roman Sketches, which appeared late in 1917, were highly favourable. But a few months later when the composer performed his largest piano work—the Piano Sonata—Musical America’s Herbert Peyser attacked it for ‘wandering in the nowhere’, and ending ‘without any disclosure of musical beauty’. Though time has vindicated it as one of the most significant piano sonatas of the twentieth century, those in search of another excursion into Impressionism were no doubt disappointed, since it conveys no programmatic images. Instead Griffes has clearly embarked on another ‘period’, one characterized by a new concision of abstract expression, and at times, a roughness which allows for harsh dissonances that many found jarring. It towers as an epic statement not easily grasped or fully appreciated in a single hearing, and though its acceptance has been hard won, many today agree with scholar and commentator Joseph Horowitz, who ranks it alongside the sonatas of Ives and Copland. Not surprisingly, Schirmer was again slow to react, and the Sonata did not see publication until a year after the composer’s death, while some other works included here (including De profundis and the Three Preludes) lay dormant for decades. Composed in 1919, the Three Preludes were not published until 1967. They were the composer’s last piano works, part of a proposed set to be titled ‘Five Pieces’—the ‘Prelude’ designations were conferred posthumously—which was left uncompleted at the time of Griffes’s death. Composed within months of the Sonata, they are remarkably brief vignettes, and the second is cast in a lean, sparse style that seems to anticipate the neo-classical writing of Stravinsky. Since Griffes left no tempo or dynamic markings, wide interpretive latitude is often shown by individual performers, and these pieces remain as enticing previews of what might have come. Equally intriguing is A Winter Landscape, which Donna Anderson, the leading Griffes scholar, speculates was composed about 1912, though she could find no reference to it in any of his papers. Incredibly, it remained unpublished until 1997, and it is unclear whether it was even offered to Schirmer, or to what the title refers. Spanning only 68 bars, it could easily stand as a homage to late Romantic piano writing, with a style at times suggestive of Rachmaninov. Regrettably, by the autumn of 1919, Griffes was unable to recover from an attack of influenza—which soon developed into pneumonia before progressing to pleural empyema—and he died at New York Hospital on 8 April 1920, at the age of thirty-five. Although there is no way to know what he might have achieved in subsequent years, the piano works in this collection affirm that America, and the world, had lost a giant. Cet hommage, prononcé par Copland à l’Université de Harvard trente-deux ans après la mort de Griffes, fut suivi d’un bref concert de musique américaine. Pourtant, cet après-midi-là, aucune pièce de Griffes ne fut jouée, sans que personne n’y trouvât à redire. Et pour cause: à l’époque, l’essentiel de son œuvre demeurait inédit, rarement enregistré, et seule une poignée de ses courtes pièces pour piano étaient considérées comme appartenant au répertoire standard. L’hommage de Copland n’en était pas moins sincère et lorsque lui-même mourut à quatre-vingt-dix ans—acclamé partout comme le doyen des compositeurs américains—, beaucoup s’accordèrent à dire que si Charles Tomlinson Griffes avait pu connaître ne fût-ce que la moitié de l’exceptionnelle longévité de son admirateur, le paysage musical américain de l’entre-deux-guerres en eût peut-être été radicalement changé. Griffes s’épanouit au crépuscule du romantisme européen et les quatre années qu’il passa en Allemagne lui valurent de fréquents contacts avec les styles musicaux les plus marquants du moment. Il fut si impressionné par Salomé, l’opéra de Strauss créé à Berlin en décembre 1906, qu’il alla quatre fois l’entendre sous la baguette du compositeur; mais il fut tout autant fasciné par Debussy, Ravel et Scriabine, une avant-garde qui lui fit écrire à sa mère, restée en Amérique: «J’ignore ce que je ferai en Amérique sans tout cela.» Mais bientôt, il fondit les dernières modes—d’une influence certes marquante sur son développement musical—en un style bien à lui et forgea un vocabulaire mélodico-harmonique différent de celui de ses contemporains. Fait remarquable, un peu plus de douze ans d’activité suffirent à ce qu’il nous laissât un catalogue d’œuvres merveilleusement ciselées, couvrant diverses «manières» stylistiques en un parcours qui ne saurait se comprendre sans ses pièces pianistiques. Même s’il joua peu de partitions majeures, il fut un brillant concertiste, et le piano fut à jamais sa première ressource et son plus proche confident. La plupart de ses compositions d’envergure naquirent ainsi au clavier, et certaines furent même publiées pour piano avant qu’il se décidât à les orchestrer. Les inclinations cosmopolites de Griffes n’avaient au départ rien d’évident puisqu’il vit le jour à trois cents kilomètres de New York, à Elmira (État de New York), une ville dont la population culmina, au temps de son adolescence, à quelque trente cinq mille âmes. Troisième des cinq enfants de Wilber et Clara (Tomlinson) Griffes, il avait pour grand-père maternel un éminent attorney d’Elmira; son père, lui, avait nettement moins réussi: pour environ vingt-cinq dollars par semaine, il travaillait comme vendeur dans des boutiques de vêtements et, régulièrement, il installa sa famille, qui s’agrandissait, dans diverses maisons de location. Par bonheur, quand ses dons furent reconnus, Charles bénéficia de la largesse de plusieurs personnes étrangères à sa proche famille, la plus remarquable ayant été Mary Selena Broughton (1862–1922), d’origine néozélandaise, qui enseigna au collège d’Elmira et avec qui il commença l’apprentissage du piano à l’âge de quinze ans. Des années auparavant, Broughton avait suivi une formation intensive en Allemagne, auprès de Karl Klindworth—élève de Liszt et confident de Wagner—et, lorsque les talents de Griffes s’affirmèrent, elle chercha naturellement à lui offrir le même genre d’opportunité éducative—d’autant qu’étudier en Allemagne était alors un peu un rite de passage obligé pour tout Américain doué. Elle lui enseigna aussi l’harmonie et supervisa ses premières compositions de jeunesse et même si Charles, comme toute la fratrie Griffes, reçut une excellente éducation à la Free Academy d’Elmira, étudier le piano avec elle le convainquit que la musique était sa juste vocation. Le 21 mai 1903, il donna dans la chapelle du collège un récital de fin d’études où figuraient des œuvres exigeantes de Chopin et de Liszt (mais aussi deux mélodies originales sur des textes français) et les critiques élogieuses parues dans trois journaux locaux contribuèrent à dissiper certaines inquiétudes parentales quant à la viabilité d’une carrière musicale—des doutes qu’atténua encore, c’est certain, la proposition de Broughton d’assumer financièrement une grande part de ses études à l’étranger. Trois mois plus tard, le 13 août, il embarqua à Hoboken (New Jersey), sur le Grosser Kurfürst, et après onze jours de traversée, il débarqua à Brême; de là, il prit le train pour Berlin, où il arriva le lendemain après-midi. Broughton, qui était déjà sur place pour les vacances d’été, l’aida à découvrir la vie culturelle allemande en l’emmenant dans les musées, les salles de concert et même au Jardin zoologique, théâtre, deux jours plus tard, d’une expérience clé: «Les animaux étaient tous là, dans les cages ouvertes … Parmi les paons, il y en avait un d’un blanc immaculé—très curieux.» Griffes ayant l’œil aussi aiguisé que l’oreille (quoique surtout autodidacte, il était un peintre habile), nul doute que cette brève rencontre lui inspira ce qui allait devenir sa plus célèbre pièce pour piano. Quoiqu’ayant toujours voulu composer, il n’envisagea d’abord qu’un séjour berlinois de deux ans avant tout centré sur le piano et Broughton fut ravie de le voir accepté par l’ancien élève et collègue de Klindworth, Ernst Jedliczka (1855–1904), éminent pianiste ukrainien qui enseigna au Conservatoire Stern de Berlin. Le jeune Américain s’exerça si assidûment qu’en juin, il fut choisi pour donner un concert estudiantin exceptionnel, à la Beethoven-Saal, auquel même Broughton assista. Lorsque Jedliczka mourut, moins de deux mois plus tard, Griffes intégra la classe de Gottfried Galston, un élève de Leschetizky qu’il appréciait, mais dont le programme de concert était si exigeant qu’il commença (presque par défaut) à davantage se concentrer sur la composition. Son professeur, Philippe Rüfer, semble avoir été des plus systématiques: après lui avoir demandé d’apporter quelques corrections à ses premières mélodies françaises, il passa à des menuets simples et à des exercices d’orchestration élémentaires—autant de devoirs que Griffes jugea fort utiles. Son plus proche camarade était alors Emil Joël, «un ami comme jamais je n’avais rêvé en trouver à Berlin». Bien que Joël fut de sept ans son aîné et qu’il étudiât le génie civil, tous deux semblaient inséparables et, à un moment, leur relation prit très certainement un tour sexuel. Dans son journal intime, Griffes se montre d’une remarquable franchise quant à sa vie homosexuelle et, s’il était bien plus discret en public, ses lettres à ses amis et à sa famille confirment que Joël était devenu le centre de son univers. Ce fut d’ailleurs avec la complicité de cet ami, également très versé dans la musique, que Charles chercha à prolonger d’une année son séjour berlinois. À vingt et un ans, l’Américain se mit en quête d’un professeur de composition plus éminent, et comme il ne se sentait pas prêt à satisfaire aux exigences de l’icône qu’était Ferruccio Busoni, Joël lui suggéra fortement de s’adresser à Engelbert Humperdinck (1854–1921), le très prisé compositeur de Hänsel und Gretel. Après avoir négocié un prêt supplémentaire auprès de Broughton, Griffes se mit à travailler avec Humperdinck en octobre 1905: il ne prit que neuf leçons (fort exigeantes) environ, mais qui furent, de son aveu même, précieuses pour son développement musical et intellectuel. Parlant l’allemant de plus en plus couramment, il continua de s’intégrer à la culture allemande. Sur les conseils de Joël, il se laissa pousser la moustache pour donner de lui une image plus mâture, il accepta des élèves pour soulager ses finances et joua souvent, comme soliste ou comme accompagnateur. À son retour à Elmira, en juillet 1907, il se dégageait de lui une confiance nouvelle, une assurance, voire une élégance nonchalante. Pendant plus d’un mois, Griffes hésita sur l’orientation à prendre, aussi fut-il ravi d’accepter, à la fin de septembre, l’offre de dernière minute que lui fit la prestigieuse Hackley School for Boys de Tarrytown (New York), à seulement une trentaine de kilomètres au nord de Manhattan. Les mercredis et samedis, ses jours de congé, il effectuait souvent le court trajet en train qui le séparait de Manhattan, où il hantait les nombreux musées et salles de concert—mais aussi les populaires lieux de rendez-vous pour homosexuels, comme les Lafayette Baths. Griffes reçut avec grand plaisir les conseils du compositeur Arthur Farwell (1872–1952), lequel, en juillet, reconsidéra malgré tout la langue musicale de ce qui ne s’appelait pas encore The Vale of Dreams, avançant qu’elle était peut-être «trop … éthérée et surnaturelle». Griffes poursuivit dans son journal: «En même temps, il considère que je suis en train de perdre le sens de la tonalité.» On ne peut pas nier que le compositeur de vingt-huit ans s’aventurait alors manifestement dans de nouveaux territoires harmoniques: les tierces majeures qui serpentent si chromatiquement à travers ses sensuelles textures debussystes paraissent souvent repousser les limites tonales. The Night Winds, achevée un an auparavant, est bien plus agitée, mais ses tierces chromatiques—qui font un lien motivique avec The Vale of Dreams—sont balancées par de rapides arpèges façonnés autour de gammes anhémitoniques, d’où une atmosphère, là encore, indéniablement impressionniste. The Lake at Evening, la plus paisible des trois «Tone-Pictures», fut terminée un an plus tôt, en 1910; elle fut également la première à être interprétée en public, quand le pianiste canadien Leslie Hodgson la créa en avril 1914 dans ce qui est désormais le Weill Recital Hall. Griffes nota le bon déroulement du concert—en réalité, la réaction du public fut si positive que Schirmer téléphona quelques jours plus tard à Hodgson pour lui demander si l’œuvre avait été publiée. Goûtant l’ironie de voir sa maison d’édition s’intéresser à une pièce qu’elle avait refusée deux ans auparavant, Griffes se sentit encore plus furieux quand, de retour dans les bureaux de Schirmer, à la fin de janvier 1915, il essuya un nouveau refus—cette partition ne connaîtrait probablement pas «un grand succès populaire». L’un des éditeurs, le chef d’orchestre et compositeur d’origine allemande Kurt Schindler, ajouta même que, selon lui, Griffes versait «trop dans l’onirisme et la subjectivité», qu’il lui «fallait davantage sortir dans le monde». Deux mois plus tard, et pour la première fois depuis son retour de Berlin, Griffes rencontra le légendaire Busoni alors en tournée à New York—une rencontre qui marqua un tournant dans sa carrière. Juste après avoir entendu The Vale of Dreams et plusieurs autres œuvres, Busoni «s’assit et écrivit une lettre à Schirmer, recommandant très chaudement mes pièces». Conséquence de cette intervention, Griffes eut bientôt un contrat d’édition pour ses Tone-Pictures (ce sera son op. 5) et huit autres manuscrits, dont ses Fantasy Pieces, op. 6: une longue Barcarolle, un Nocturne (Notturno) et un Scherzo haut en couleur. Bâti essentiellement autour des touches noires, ce dernier est une badinerie tumultueuse, où la main gauche rythmique souligne souvent une gamme pentatonique tandis que la main droite est ponctuée de ces sourdes quintes à vide auxquelles Griffes recourait parfois pour suggérer l’exotisme extrême-oriental—un thème appelé à devenir récurrent chez lui. En mai 1915, Griffes, passionné autant de littérature que d’images sonores et visuelles, passa toute une journée à la Bibliothèque publique de New York, en quête de poésies susceptibles de précéder chacune de ses pièces avant leur impression. En une semaine, il avait trouvé les exergues à ses Three Tone-Pictures et à ses Fantasy Pieces et, même s’ils furent choisis après coup, ces programmes semblent saisir avec une remarquable acuité ses climats musicaux. Le Scherzo est ainsi précédé de deux phrases d’un poète inconnu évoquant un «Palais des enchantements», où des «esprits fantastiques» dansent «grotesquement sur une musique désormais surnaturelle et mystérieuse». Pour les autres pièces, il choisit des extraits de Yeats, Poe, Verlaine et William Sharp (1855–1905), un auteur écossais qui écrivit beaucoup sous le pseudonyme de «Fiona MacLeod». Griffes était particulièrement attiré par la poésie de Sharp, dont le recueil de vers libres Sospiri di Roma (1891) lui inspira pas moins de cinq œuvres supplémentaires, dont le De profundis, achevé en novembre 1915 mais publié en 1976 seulement—et ce malgré les majestueuses et charmeresses chaînes d’harmonies scriabinesques qui firent l’admiration des amis et partenaires de Griffes. Le 23 août 1916, Schirmer accepta quatre nouvelles œuvres inspirées des Sospiri, qui seront vite connues sous le nom de Roman Sketches op. 7, la plus illustre étant sans contredit The White Peacock, entrée presque tout de suite et durablement dans le répertoire pianistique. Myra Hess l’enregistra dès 1929, imitée par Samaroff un an plus tard; l’interprétation qu’en donna Griffes nous a été conservée sur un rouleau pour piano mécanique Duo-Art datant de 1919. Quel que soit ce qui lui a «vraiment» inspiré cette pièce (sa première visite au zoo de Berlin, un poème de Sharp ou, comme il le dit une fois à un ami, la simple contemplation d’un coucher de soleil pendant un trajet en train entre Tarrytown et Manhattan), sa maîtrise des images impressionnistes semble sans faille. Tout aussi pittoresque est le taraudant Nightfall, avec ses séduisants accords de neuvième et de treizième, suivi de The Fountain of the Acqua Paola, plus virtuose encore, et de Les jeux d’eaux à la Villa d’Este, un magistral hommage à Liszt. Coulé dans une mesure à 7/4, Clouds, qui clôt le corpus, flotte dans des harmonies richement diatoniques avant de se fragmenter en une bitonalité qui ne laisse d’annoncer le langage du XXe siècle. Les critiques des Roman Sketches, parues à la fin de 1917, furent des plus favorables. Mais quelques mois plus tard, Herbert Peyser, du Musical America, entendit Griffes interpréter sa plus grande œuvre pianistique—la Sonate pour piano—qui, railla-t-il, «n’allait nulle part» et s’achevait «sans dévoiler la moindre beauté musicale». Même si le temps a prouvé qu’il s’agissait d’une des plus importantes sonates pour piano du XXe siècle, ceux qui espéraient une nouvelle incursion dans l’impressionnisme en furent pour leurs frais, car elle ne charrie aucune image programmatique. À l’évidence, Griffes a préféré se lancer dans une autre «manière», marquée par une nouvelle concision expressive abstraite et, parfois, par une rudesse autorisant des dissonances stridentes, souvent jugées discordantes. Cette œuvre apparaît comme une énonciation épique impossible à saisir aisément ou à apprécier pleinement en une seule écoute et même si elle fut reconnue de dure lutte, beaucoup rejoignent aujourd’hui le spécialiste et critique Joseph Horowitz, qui la range aux côtés des sonates de Ives et de Copland. Bien sûr, Schirmer fut, une fois encore, lent à réagir, et la Sonate ne fut publiée qu’un an après la mort de Griffes—certaines des œuvres réunies ici (dont le De profundis et les Three Preludes) sommeillèrent pendant des décennies. Composés en 1919, les Three Preludes ne parurent qu’en 1967. Griffes conçut ces pièces, ses dernières pour piano, dans le cadre d’un projet de corpus intitulé «Five Pieces»—l’appellation «Preludes» s’imposa posthumement—, resté inachevé à sa mort. Rédigées quelques mois après la Sonate, ces vignettes sont remarquablement brèves, la seconde étant coulée dans un style économe et raréfié qui semble préfigurer le néoclassicisme stravinskien. Comme Griffes ne laissa aucune indication de tempo ou de dynamique, les interprètes s’arrogent souvent toute latitude et ces pièces demeurent les attrayants fourriers de ce qui aurait pu advenir. Tout aussi intrigant est A Winter Landscape, que Donna Anderson, la grande spécialiste de Griffes, date de 1912 environ, encore qu’elle n’en ait pas trouvé mention dans les papiers du compositeur. Chose incroyable, cette œuvre demeura inédite jusqu’en 1997 et on ignore si elle fut même proposée à Schirmer et à quoi son titre fait référence. Avec seulement soixante-huit mesures et un style évoquant parfois Rachmaninov, elle pourrait volontiers passer pour un hommage à l’écriture pianistique du romantisme tardif. Malheureusement, à l’automne de 1919, Griffes ne parvint pas à se remettre d’une grippe—qui dégénéra bientôt en pneumonie puis en empyème pleural—et il mourut à l’hôpital de New York le 8 avril 1920, à l’âge de trente-cinq ans. On ne saura jamais ce qu’il aurait pu encore accomplir mais les œuvres pour piano enregistrées ici le clament: l’Amérique, et le monde, venaient de perdre un géant. An Coplands Lobrede, die er rund 32 Jahre nach dem Tod von Griffes an der Harvard-Universität hielt, schloss sich ein kurzes Konzert mit amerikanischer Musik an, doch von Griffes’ Werken erklang an diesem Nachmittag kein einziges. Niemand beschwerte sich darüber, denn ein Großteil seines Schaffens war zu diesem Zeitpunkt noch unveröffentlicht, es gab kaum Aufnahmen seiner Werke, und nur einige wenige seiner kürzeren Klavierstücke zählten damals zum Standardrepertoire. Coplands Würdigung kam dennoch von Herzen, und als er selber—als unangefochtener Doyen unter den amerikanischen Komponisten—mit 90 Jahren verstarb, waren sich viele einig, dass die amerikanische Musiklandschaft der Zwischenkriegszeit völlig anders ausgesehen hätte, wenn Charles Tomlinson Griffes auch nur halb so viele Lebensjahre wie seinem Bewunderer Copland beschert gewesen wären. Griffes Blütezeit fiel in die Spätphase der europäischen Romantik, und während der vier Jahre, die er in Deutschland verbrachte, kam er immer wieder mit den führenden musikalischen Persönlichkeiten der Zeit und ihrem Schaffen in Berührung. Von Strauss’ im Dezember 1906 in Berlin uraufgeführter Salome war er so begeistert, dass er sich die Oper gleich viermal unter Leitung des Komponisten anhörte, doch genauso faszinierten ihn die avantgardistischen Klänge von Debussy, Ravel und Skrjabin. An seine Mutter in der Heimat schrieb er: „Ich weiß nicht, was ich in Amerika ohne all diese Dinge anfangen soll.“ Doch obwohl die neuesten Strömungen ihn in seiner Entwicklung unverkennbar prägten, verschmolz er sie schon bald zu einem ganz eigenen Stil und schuf eine melodische und harmonische Sprache, die sich von der seiner Zeitgenossen deutlich unterschied. Angesichts der kaum mehr als zwölf Jahre, die er schöpferisch tätig war, hinterließ er eine erstaunliche Zahl von handwerklich vollendeten Kompositionen, die sich unterschiedlichen stilistischen „Perioden“ zuordnen lassen. Seinen Klavierwerken kommt dabei eine Schlüsselrolle für das Verständnis seiner Entwicklung zu. Auch wenn er selten in größerem Rahmen auftrat, war er ein glänzender Pianist, und das Klavier war stets seine erste Anlaufstelle und sein engster Vertrauter. Die meisten seiner größeren Werke nahmen ihren Ausgang an der Klaviatur, und manche erschienen als Klavierstücke, ehe er sich entschloss, sie zu orchestrieren. Angesichts seiner Wurzeln mag Griffes’ Weltoffenheit überraschen, wurde er doch in Elmira (New York) geboren, einem recht überschaubaren Städtchen, das über 300 Kilometer von New York City entfernt liegt und dessen Einwohnerzahl in Griffes Jugendjahren mit 35.000 ihren Höchststand erreichte. Er war das dritte von fünf Kindern des Ehepaars Wilber und Clara (Tomlinson) Griffes, und obwohl sein Großvater mütterlicherseits in Elmira ein bekannter Anwalt gewesen war, hatte sein Vater weitaus weniger Erfolg und schlug sich für etwa 25 Dollar pro Woche als Verkäufer in Bekleidungsgeschäften durch, während er mit seiner wachsenden Familie von einer Mietunterkunft in die nächste zog. Als man Charles’ Talent erkannte, kamen dem Jungen glücklicherweise mehrere Außenstehende großzügig zu Hilfe, allen voran die aus Neuseeland stammende Mary Selena Broughton (1862–1922), die am Elmira College unterrichtete und bei der er ab seinem 15. Lebensjahr Klavierunterricht nahm. Broughton hatte einst in Deutschland eine intensive Ausbildung bei Karl Klindworth genossen—seines Zeichens Schüler von Liszt und Vertrauter von Wagner—, und so überrascht es kaum, dass sie Griffes angesichts seiner wachsenden Begabung eine ähnliche Bildungschance bieten wollte, zumal ein Studium in Deutschland für talentierte Amerikaner nach wie vor als notwendige Erfahrung galt. Sie unterrichtete ihn außerdem in Harmonielehre und unterstützte ihn bei der Komposition seiner ersten Jugendwerke. Obwohl alle Kinder der Familie Griffes an der Elmira Free Academy eine hervorragende Ausbildung erhielten, gelangte Charles durch den Klavierunterricht zu der Überzeugung, dass die Musik seine Berufung sei. Am 21. Mai 1903 gab er in der Kapelle des College ein Abschlusskonzert, bei dem (neben zwei eigenen Liedern auf französische Texte) auch anspruchsvolle Werke von Chopin und Liszt auf dem Programm standen. Das große Lob, das ihm drei der örtlichen Zeitungen daraufhin spendeten, nahm seinen Eltern etwas von der Sorge, mit der sie einer musikalischen Laufbahn unter praktischen Aspekten entgegensahen. Broughtons Angebot, einen Großteil von Charles’ Auslandsstudium vorzufinanzieren, dürfte ihre Ängste zusätzlich gelindert haben, und drei Monate später, am 13. August, stach er in Hoboken (New Jersey) auf der Großer Kurfürst in See. Elf Tage später legte das Schiff in Bremen an, und am folgenden Nachmittag traf Griffes in Berlin ein. Broughton war dort bereits im Sommerurlaub und half ihm dabei, sich in der Stadt und ihrer Kultur einzuleben, indem sie ihn in Museen, Konzertsäle und sogar in den Zoologischen Garten mitnahm. Dort hielt er zwei Tage später ein entscheidendes Erlebnis festhielt: „Die Tiere waren alle draußen in den offenen Käfigen. […] Unter den Pfauen war ein ganz weißer—sehr merkwürdig.“ Griffes’ Auge war ebenso wach wie sein Ohr (obwohl er überwiegend Autodidakt war, hatte er auch als Maler Talent), und zweifellos diente ihm diese kurze Begegnung als Inspiration für sein später bekanntestes Klavierstück. Auch wenn er stets danach strebte, sich als Komponist zu betätigen, hatte er zunächst nur einen zweijährigen Aufenthalt in Berlin mit Schwerpunkt auf dem Klavierspiel vorgesehen. Zur Freude von Broughton erklärte sich Klindworths einstiger Schüler und Kollege Ernst Jedliczka (1855–1904) bereit, ihn zu unterrichten. Jedliczka, ein angesehener Pianist, stammte aus der Ukraine und unterrichtete in Berlin am Stern’schen Konservatorium. Der junge Amerikaner übte so fleißig, dass er schon im Juni dazu ausgesucht wurde, bei einem Sonderkonzert mit Schülern des Konservatoriums im Beethoven-Saal aufzutreten, zu dem selbst Broughton kam. Als Jedliczka kaum zwei Monate später starb, wechselte Griffes zu Gottfried Galston, einem Schüler von Leschetizky, den er sehr schätzte, dessen Konzertverpflichtungen jedoch so umfangreich waren, dass Griffes sich (quasi notgedrungen) mehr und mehr dem Komponieren widmete. Sein Lehrer Philippe Rüfer verfolgte offenbar einen überaus systematischen Ansatz und ließ ihn zunächst einige Stellen in seinen frühen französischen Liedern korrigieren, ehe man sich an einfachen Menuetten und grundlegenden Instrumentationsübungen versuchte. Griffes hielt diese Aufgabenstellungen für überaus sinnvoll. Zu seinem engsten Gefährten war mittlerweile Emil Joël geworden, und Griffes hielt fest: „Nie hätte ich mir erträumt, in Berlin einen solchen Freund zu finden.“ Obwohl Joël sieben Jahre älter war und Bauingenieurwesen studierte, schienen die beiden unzertrennlich zu sein, und im Laufe der Zeit entwickelte sich mit Sicherheit auch ein intimes Verhältnis. In seinem Tagebuch äußerte sich Griffes erstaunlich offen über seine Homosexualität, und auch wenn er gegenüber Dritten größere Diskretion wahrte, bezeugen doch seine Briefe an Freunde und Familie, dass Joël zum Mittelpunkt seines Lebens geworden war. Letzterer war außerdem auf dem Gebiet der Musik sehr bewandert, und schon bald suchten die beiden mit vereinten Kräften nach einer Möglichkeit, Griffes’ Aufenthalt in Berlin um ein weiteres Jahr zu verlängern. Mit inzwischen 21 Jahren war der junge Amerikaner nun auf der Suche nach einem bekannteren Kompositionslehrer, und da er sich nicht zutraute, den Ansprüchen des gefeierten Ferruccio Busoni zu genügen, legte Joël ihm dringend nahe, sich an Engelbert Humperdinck (1854–1921) zu wenden, den allseits angesehenen Schöpfer der Oper Hänsel und Gretel. Nachdem Griffes mit Broughton ein zusätzliches Darlehen ausgehandelt hatte, begann er im Oktober 1905 den Unterricht bei Humperdinck, und obwohl er nur neun (überaus anspruchsvolle) Kompositionsstunden bei ihm nahm, erklärte er später, dass diese Erfahrung für seine musikalische und geistige Entwicklung von unschätzbarem Wert gewesen sei. Mit zunehmend sicherer Beherrschung der Sprache passte er sich der deutschen Kultur immer weiter an. Auf Anraten von Joël ließ er sich einen Schnurrbart wachsen, um einen reiferen Eindruck zu machen; er nahm Schüler an, um seine Kosten zu decken, und trat regelmäßig als Solist und Begleiter auf. Als er im Juli 1907 schließlich nach Elmira zurückkehrte, strahlte er ein neuentdecktes Selbstvertrauen aus und trat selbstbewusst, ja mit lässiger Eleganz auf. Über einen Monat lang war Griffes unsicher, wie es weitergehen sollte, weshalb er ein kurzfristiges Stellenangebot der renommierten Hackley School for Boys in Tarrytown (New York) Ende September mit Freude annahm. Die Schule lag nur 40 Kilometer nördlich von Manhattan, so dass er an seinen freien Tagen (mittwochs und samstags) oft mit dem Zug ins nahe Stadtzentrum fuhr, wo er New Yorks zahlreiche Museen und Konzertsäle besuchte—ebenso wie beliebte Treffpunkte für Homosexuelle, etwa die Lafayette-Bäder. Den Ratschlägen und Anregungen des Komponisten Arthur Farwell (1872–1952) schenkte Griffes besonderes Gehör, doch im Juli des Jahres begann selbst Farwell, die Klangsprache des (immer noch titellosen) Vale of Dreams zu überdenken, und er merkte an, dass es womöglich „zu […] ätherisch und überirdisch“ sei. In Griffes Tagebuch heißt es weiter: „Außerdem meint er, dass mir die tonale Wirkung abhandenkommt.“ Ohne Frage war der 28-jährige Komponist dabei, in neue harmonische Bereiche vorzustoßen; immerhin scheinen die großen Terzen, die sich so chromatisch durch seine sinnlichen, an Debussy gemahnenden gestalterischen Abschnitte ziehen, oft an die Grenzen der Tonalität zu stoßen. The Night Winds („Die Nachtwinde“)—ein Jahr zuvor vollendet—ist sehr viel aufgewühlter, doch die chromatischen Terzen (durch die ein motivischer Bezug zum Vale of Dreams entsteht) werden hier von raschen Arpeggien aufgefangen, die auf Ganztonskalen basieren und der Musik so wiederum ein unverkennbar impressionistisches Gepräge verleihen. Das besinnlichste der drei Stücke, The Lake at Evening („Der abendliche See“), wurde ein weiteres Jahr zuvor (also 1910) vollendet und kam als erstes öffentlich zu Gehör; der kanadische Pianist Leslie Hodgson brachte es im April 1914 in dem heute als Weill Recital Hall bekannten Saal im Gebäude der New Yorker Carnegie Hall zur Uraufführung. Griffes vermerkte, dass die Aufführung erfolgreich verlaufen sei—die Reaktion des Publikums war sogar so positiv, dass Schirmer einige Tage später bei Hodgson anrief, um sich zu erkundigen, ob das Werk schon veröffentlicht sei. Ganz abgesehen von der ironischen Wendung, dass der Verlag nun an einem Werk interessiert schien, das er zwei Jahre zuvor abgelehnt hatte, war es ein erneuter Besuch im Verlagsbüro Ende Januar 1915, der Griffes’ Verärgerung noch steigerte, denn er erfuhr abermals eine Ablehnung—mit der Begründung, das Werk habe wenig Aussicht auf „Erfolg bei der Allgemeinheit“. Der in Deutschland geborene Dirigent und Komponist Kurt Schindler—einer der Lektoren—ergänzte, Griffes schreibe „zu träumerisch und subjektiv“ und solle „sich öfter einmal in der Außenwelt herumtreiben“. Zwei Monate später traf Griffes sich zum ersten Mal seit seiner Berliner Zeit mit dem legendären Busoni, der sich im Rahmen einer Konzertreise gerade in New York aufhielt. Diese Begegnung erwies sich als entscheidender Wendepunkt für sein berufliches Fortkommen. Nachdem Busoni sich das Vale of Dreams und mehrere andere Werke angehört hatte, zögerte er keine Minute, „setzte sich hin und schrieb einen Brief an Schirmer, in dem er meine Stücke in den höchsten Tönen anpries“. Dank seiner Fürsprache hatte Griffes binnen Kurzem einen Vertrag zur Veröffentlichung der Tone-Pictures in der Tasche, die als op. 5 erschienen. Die Vereinbarung umfasste außerdem acht weitere Manuskripte, darunter die Fantasy Pieces op. 6, bestehend aus einer ausgedehnten Barcarolle, einem Nocturne (Notturno) und einem facettenreichen Scherzo. Bei Letzterem handelt es sich um eine derbe Posse, die sich überwiegend auf den schwarzen Tasten abspielt und in der die rhythmisch geprägte linke Hand oft eine pentatonische Skala beschreibt. In der rechten Hand erklingen derweil immer wieder leere Quinten, wie Griffes sie mitunter in Anlehnung an die exotischen Klänge des Fernen Ostens verwendete—ein wiederkehrendes Merkmal seiner späten Werke. Griffes begeisterte sich nicht nur für die Bildsprache von Kunst und Musik, sondern auch für die Literatur, und im Mai 1915 verbrachte er einen ganzen Tag damit, in der New York Public Library passende Texte zu suchen, die er den einzelnen Stücken voranstellen konnte, bevor sie in Druck gingen. Nach einer Woche hatte er Mottos für sämtliche Tone-Pictures und Fantasy Pieces gefunden, und auch wenn diese „programmatischen“ Verse erst nachträglich ausgesucht wurden, scheinen sie seine musikalischen Stimmungsbilder doch mit erstaunlicher Genauigkeit zu beschreiben. Das Scherzo etwa wird von zwei Sätzen eines unbekannten Dichters eingeleitet, in denen von einem „Schloss der Verzauberung“ die Rede ist, wo „Traumgeister“ zu einer „heute sonderbaren und unheimlichen Musik grotesk tanzen“. Für die restlichen Stücke wählte er Zitate von William Butler Yeats, Edgar Allan Poe, Paul Verlaine sowie von William Sharp (1855–1905), einem schottischen Schriftsteller, der unter dem Pseudonym „Fiona MacLeod“ zahlreiche Werke schuf. Von Sharps Dichtung war Griffes in besonderem Maße fasziniert, und die in freien Versen verfasste Sammlung Sospiri di Roma von 1891 inspirierte ihn gleich zu fünf weiteren Werken, darunter das im November 1915 vollendete De profundis („Aus der Tiefe“). Mit seinen majestätischen und betörenden Harmoniefortschreitungen nach Art von Skrjabin stieß es bei Griffes Freunden und Begleitern zwar auf große Bewunderung, aber dennoch blieb es bis 1976 unveröffentlicht. Am 23. August 1916 nahm Schirmer vier weitere Werke an, die von den Sospiri inspiriert waren und die bald darauf unter dem Titel Roman Sketches („Römische Skizzen“) op. 7 erschienen. Das zweifellos bekannteste ist The White Peacock („Der weiße Pfau“), das sich in der englischsprachigen Welt fast umgehend einen bleibenden Platz im pianistischen Repertoire sicherte. Myra Hess spielte das Stück bereits 1929 ein, Olga Samaroff ein Jahr später, und Griffes’ eigene Interpretation von 1919 ist auf einer Notenrolle der Marke Duo-Art erhalten. Unabhängig davon, ob ihm tatsächlich sein erster Besuch im Berliner Zoo oder vielmehr Sharps Gedicht als Anregung dienten (oder gar der Anblick des Sonnenuntergangs auf der Zugfahrt von Tarrytown nach Manhattan, wie er es einem Freund erzählte), so ist seine Beherrschung der impressionistischen Tonmalerei doch über jede Kritik erhaben. Ebenso malerisch ist das eindringliche Stück Nightfall („Dämmerstunde“) mit seinen verlockenden Non- und Tredezim-Akkorden, an das sich das noch virtuosere The Fountain of the Acqua Paola („Der Brunnen der Acqua Paola“) anschließt—eine meisterliche Hommage an Liszts Les jeux d’eaux à la Villa d’Este. Das abschließende, im 7/4-Takt gehaltene Clouds („Wolken“) gleitet auf einem üppigen Strom diatonischer Harmonien dahin, ehe es in eine Bitonalität zerfällt, die schon eindeutig auf die Musiksprache des 20. Jahrhunderts verweist. Die Roman Sketches erschienen Ende 1917 und stießen sie bei der Kritik auf überaus positive Reaktionen. Doch schon wenige Monate später, als der Komponist mit der Klaviersonate sein längstes Klavierwerk vorstellte, kritisierte der Rezensent der Zeitschrift Musical America, Herbert Peyser, sie geistere „im Nirgendwo umher“ und schließe „ohne jedweden Anflug musikalischer Schönheit“. Mit der Zeit konnte sie sich zwar ihre rechtmäßige Stellung als eine der wichtigsten Klaviersonaten des 20. Jahrhunderts sichern; all jene aber, die sich damals einen neuerlichen Ausflug in den Impressionismus erhofft hatten, waren zweifellos enttäuscht, bietet das Werk doch keinerlei programmatische Tonmalerei. Stattdessen hatte sich Griffes offensichtlich abermals einer neuen „Periode“ zugewandt, die von einer bisher ungekannten Knappheit und Abstraktion im Ausdruck geprägt war. Eine gelegentliche Schroffheit bot zudem Raum für krasse Dissonanzen, die für viele Hörer eine klangliche Zumutung darstellten. Als kühne Schöpfung von epischen Ausmaßen ist die Sonate beim ersten Hören nicht leicht zu erfassen oder gar zu würdigen. Doch auch wenn sie sich ihre Anerkennung mühevoll erkämpfen musste, stößt das Urteil des Wissenschaftlers und Kritikers Joseph Horowitz, der sie mit den Sonaten von Ives und Copland auf eine Stufe stellt, heute auf breite Zustimmung. Es überrascht kaum, dass Schirmer erneut nur schleppend reagierte, und die Sonate wurde erst ein Jahr nach dem Tod des Komponisten veröffentlicht. Manch andere der hier eingespielten Werke (darunter De profundis und die Three Preludes) schlummerten sogar jahrzehntelang in den Regalen. Die Three Preludes entstanden 1919, kamen aber erst 1967 zur Veröffentlichung. Sie sind die letzten Klavierwerke von Griffes und waren ursprünglich als Teil einer Sammlung mit dem Titel „Five Pieces“ gedacht, die durch den Tod des Komponisten unvollendet blieb; die Bezeichnung „Prelude“ erhielten die Stücke posthum. Es handelt sich um auffallend kurze Charakterskizzen, die nur wenige Monate nach der Sonate komponiert wurden. Die zweite dieser Skizzen ist in einem sparsamen, kargen Stil gehalten, der den neoklassizistischen Tonfall von Strawinsky vorwegzunehmen scheint. Da Griffes keine Angaben zu Tempo oder Dynamik hinterließ, kosten viele Pianisten ihre interpretatorische Bewegungsfreiheit sehr individuell aus, und die Stücke bieten einen faszinierenden Ausblick darauf, was hätte folgen können. Auch A Winter Landscape („Eine Winterlandschaft“) wirft zahlreiche Fragen auf. Die führende Griffes-Forscherin Donna Anderson vermutet, dass das Stück um das Jahr 1912 entstand, auch wenn sie in seinen Aufzeichnungen keinen Hinweis darauf finden konnte. Es ist erstaunlich, dass es bis 1997 unveröffentlicht blieb, wobei unklar ist, ob Griffes es Schirmer überhaupt anbot oder worauf sich der Titel bezieht. Mit seinem bisweilen an Rachmaninow erinnernden Stil ließe sich das nur 68 Takte umfassende Stück durchaus als Hommage an die spätromantische Klaviersprache betrachten. Im Herbst 1919 erlitt Griffes einen Grippeanfall, von dem er sich leider nicht mehr erholte und der sich schnell zu einer Lungenentzündung und schließlich zu einer Rippenfellvereiterung auswuchs. Am 8. April 1920 starb Griffes mit 35 Jahren im New York Hospital. Obwohl niemand sagen kann, was er in den Folgejahren noch hätte erreichen können, belegen die hier eingespielten Klavierwerke, dass Amerika und die Welt mit ihm einen der ganz Großen verloren hatten.